Now to that contentious testimony on capitol hill. Acting attorney general Matt Whitaker grilled by house Democrats. ABC’s white house correspondent Tara Palmeri is at the white house with what he said about the Mueller investigation and what he wouldn’t talk about. Tara, good morning. Reporter: Good morning, whit. It was the first opening act of ld likely be a stream of -profile hearings into people closest to the present and they wanted to know, the democrf he had done anything in his four-month tenure to impede the Mueller investigation. On capitol hill, acting attorney general Matthew Whitaker with one week left on the job grilled by members of the house judiciary committee. We’re all trying to figure out who are you? Where did you come from and how the heck did you become the head of the department of justice? Reporter: Starring in a six-hour heated hearing that zeroed in on his vision of the Russia investigations, Democrats flexing their new oversight powers into the trump administration. And Whitaker firing right back. In your capacity as acting attorney general, have you ever been asked to approve any request or action to be taken by the special counsel? Mr. Chairman, I see that your five minutes is up and so — I am here voluntarily. Reporter: Before becoming the nation’s top law enforcer Whitaker criticized Robert Mueller’s investigation into possible campaign collusion with Russia but now claiming since assuming his current role as acting attorney general that he has done nothing to hinder the probe. There has been no event, decision that has required me to take any action, and I have not interfered in any way with the special counsel’s investigation. I have not talked to the president of the United States about the special counsel’s investigation. Reporter: And while vowing to tell the truth, refusing to say whether he spoke to the president about a case outside of the Mueller investigation, a campaign finance probe into trump’s longtime lawyer and fixer Michael Cohen. I want to know whu talked to president trump at all about the southern district of New York’s case involving Michael Cohen. Congresswoman, as I’ve mentd several times today, I am not going to discuss my private conversations with the president of the United States. Reporter: Republicans claiming the marathon trial was all for show. Bring your popcorn. Ng about maybe we just set up a popcorn machin the back because that’s what this is becoming. Reporter: Whitaker’s successor William Barr will likely be confirmed in the next week hearing was more of a warning shot from Democrats if they sense any meddling into the Russia investigation. Dan. Tara, thank you so much. Let’s talk now to our ringer, ws chief political analyst Matthew dowd who is coming to us from Texas. So, Matthew, you heard in Tara’s piece Republicans saying let’s set a popcorn machine, this is a circus. Any truth to that allegation or do you think actually we learned some important substantial things here? Well, maybe instead of a circus I would call it a bazaar because of the tone and the manner with which it was conducted. Substantively, I don’t think we learned much of anything in because whitar would refuse to answer the questions, but tonally I think we learned lot. 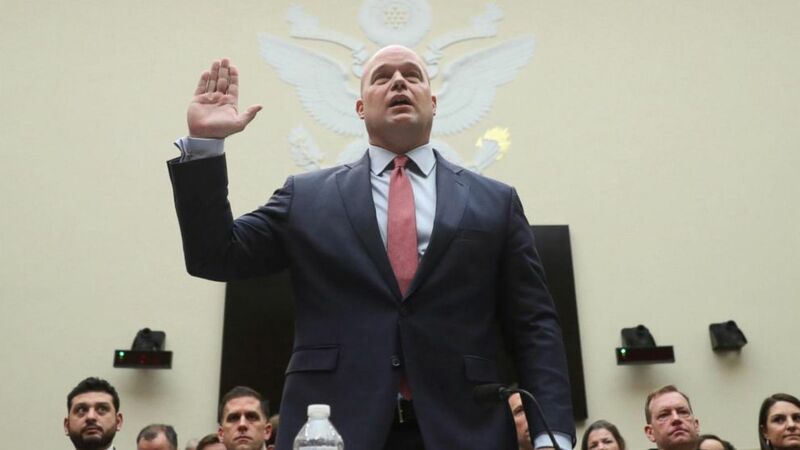 I think we learned wt Matt Whitaker thinks of congress and by extension what the president thinks of this congress. I’ve often said the president is not upset with Nancy Pelosi the congress, he’s upset with James Madison because he doesn’t like the checks and balances. For the had a congress that didn’t ask the tough questions. Now he has a democratic establishment and democratic members who are asking the tough questions of him and his cabinet. But it looks like these tough questions that you mentioned, we could be hearing a lot of them in hearings like the one we saw yesterday over the next two years. Is it possible that the Democrats run the risk of overdoing it here? Yeah, it’s very possible. I mean, I think the chairman of the committee, Jerry Nadler, I think handled it very well and I think his demeanor and the way he engaged was very well done but I think some of the other members I think pushed it too far and I think democts have to be really careful that the American public doesn’t look at this whole thing and say, nothing is functional. It’s not working, so, yes, I think the Democrats have to be careful on how they do this. I think they’re aware of that but sometimes when people get one and theater takes effect, they go too far. So speaking of dysfunction, let’s loop back to our top story, Virginia, where we have the three top officials in the state under assault. All of them are staying in their jobs for now but where do you think we’re heading with this thing? Can all three of these men tough ity in office? Well, you know, as I’ve watched this, it’s like a game of survivor where the tribal council votes somebody off and they don’t leave the island. And none of these three seem willing to leave the island though there have been demands on many of them, almost all of them to leave. I think what is likely to happen because of the allegations against the lieutenant governor of sexual assault, I think the most likely scenario is that he steps down. I think we now have two women in this who have made Val allegations of sexual assault but I think nobody knows where this goes from here. It looks like the governor has dug in and he is not going to leave but it is a — talk about a bizarre situation. Virginia is a bizarre situation. He’s dug in with so many people calling for him to resign. It’s unclear who he’ll be able to work with going forward. Thanks and we’re disappointed you didn’t mention “Deuce bigalow 2.” I got “Survivor” in. I got “Survivor” in. I got “Survivor” in. Credit where it’s due. Thank you, Matthew. Appreciate it. We always appreciate the Matt dowd references to pop culture as well.